Today was mainly spent checking out some of the architectural works of Antoni Gaudi. The most famous being the Sagrada Familia, still not finished despite construction having commenced in 1911. I had mixed feelings about the church, in one sense I thought it an eyesore, a mix of eratic images piled upon one another. I can see its grandeur, and I do appreciate its monumental nature, but no matter how I looked at it I could not take it in without feeling lost and a little giddy. 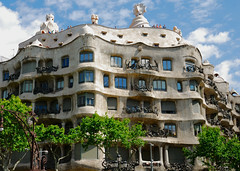 More enjoyable to look at where the Casa Mila La Pedrera and Casa Batllo. Both these buildings are lively and colourful and show real pizazz when you consider they were built in the early 1900’s. I am very curious to learn about what sort of a person Gaudi was and I have added him to a growing reading list for my return to Australia. Moving along we visited El Courte Ingles, the largest department store in Barcelona (and certainly larger than any in Australia). This was on strict recommendation from a friend in Toronto and whilst the prices where a little much for this pair of backpackers, we did make a purchase – a battery charger! I had planned for the evening the Magic Fountain, cascading from the base of the Palau Nacional and featuring a sound and light show. Unfortunatley it was not running so after so we trudged back into town for more Paella and Sangria. Another overnight train ride, this time arriving in Barcelona. Relativly uneventful, however we did get stuck on a carriage with a group of 40 Parisean students. Along the way we met two other backpackers, one who is living in Toronto and the other in Holland, both friends originally from Iran. We joined forces making our way to the hostel together followed by a little sightseeing in the evening. 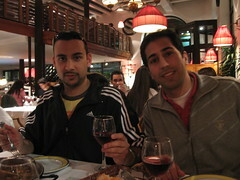 The night ended with the four of us enjoying Paella and Sangria at this great restaraunt off La Rambla (one of the main strips of Barcelona). Our hostel is in the gothic area, not far from the Picasso Museum, Catedral Barcelona and a number of other attractions. The area is a maze of alleys running between old stone buildings and little churches. very good for exploring! As we depart Paris I’d like to share a few of my thoughts on the city and our time here. The first is in regard to paying for public toilets. If people cannot afford to or choose not to pay for a public toilet they will not just not ‘go’, they will urinate in the streets, train stations and parks instead. 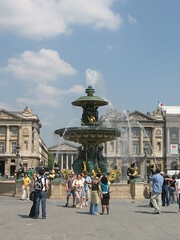 Paris stinks of urine, in some places enough to make you reech. This comment could be applicable to other European cities as well, but no other thus far has been so offensive. Gypsies. If you come to Paris, be prepared to be assulted by gypsie women asking if you speak english and presenting a post card with a message asking for money. Walk away as fast as possible. From our observations it seems to be some kind of organised pan handling co-op. Around the tourist sites we counted as many as 30 of these women, aged from mid teens to middle aged. While the millitary armed with riffles walk the city and vans full of police in riot gear await the next revlotuion, a blind eye is turned to this scam of what seems to be Paris’s largest resource – Tourists. Despite these two comments, we have immensly enjoyed our time here and you can’t help but be amazed by the history, arcitechure, art and culture of Paris. There are very few other places that could compete. Thanks to the Da Vinci Code, the Louvre has been shrouded in a mystique that has some poor wretches believing it holds the secrets to the holy grail, catholism and even God. Whilst Dan Brown is quite a story teller I think the Louvre is intriguing enough without the fiction and so I shan’t mention the said novel again. The building itself holds historical signifigance as being the former residence of the French Royality and its collection, in excess of 35,000 pieces, includes some of the worlds most influential and well known items. The musuem attracts in excess of 8 million tourists a year and today we saw our fair share. Whilst we didn’t queue for very long to get into the Louvre, on entering we immediatly became aware of the heaving sea of people converging on the Venus de Milo and the Mona Lisa. Encased in glass and only about 30 x 20 inches in size, the Mona Lisa is an enticing painting and even as you move away from her, she holds your gaze with her little smile. Similary the Venus de Milo is very pleasing to the eye and stands out as being far more detailed (and larger) than the many other stone portraits in the Louvre. Also of note is Louie XIV’s Crown, far more colourful, and almost juvenile, compared to the Scotland Honours. 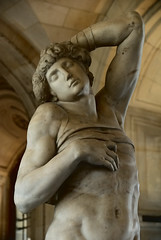 Michelangelo’s Dying Slave (above) is also housed here and is one the most expressive statues I have seen. 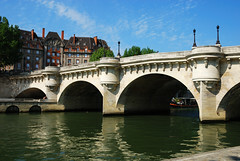 The Louvre’s entire collection is catalogued on its website if you are interested, but set aside a bit of time! Visiting the Louvre was a not a relaxing experience, nor was it particulary educational one, there were far to many people. However I would not have left without going and I recommend those who visit Paris to go, if only to see the few pieces I have mentioned and the museum’s interior. The final Notre Dame on our list. Whilst it is by far the largest, it is not as ornate as the Canadian Notre Dame’s in Ottawa, Montreal or Quebec. We didn’t spend too much time here as it was a Sunday, Mass was taking place amongst the thousands of tourists who walked around the cathedral taking photos, it just felt a little strange. Here is an exterior shot, some people got in the way, I hope you can ignore them. After resting our legs yesterday it was time to put them back to use again. We joined a walking tour with a company that operates throughout Europe relying on tips alone. Darian, our guide, was taking his very first tour today and did an outstanding job. There are so many beautiful buildings, parks and monuments in Paris that it would be impossible to see them all in 3.5 hours but we had a good crack at it. Starting at St Michel we made our way along the Seine, through the exterior of the Louvre, Jardin des Tuileries gardens, saw Palais Royal, up to Place de la Concorde (the photo above) where the oldest object in Paris is – an oblisk donated by egypt, finishing with a walk down Champ des Elysees. All of this walking was done in 30 degree heat which we are still yet to fully aclimatise too after our time in Canada. Following the guided tour we walked the rest of Champ des Elysees to see the Arc de Triomphe. Its great to be here amoungst all of these famous sites that I had only ever seen in movies like Ronin or the Bourne Identity. Back we treked to the Eiffel Tower to check out the light display they put on after dark, we had caught a glimpse through the buildings last night and wanted to see it up close. The lights change from simple illumination to dazzling. The whole of Paris also seems to turn out here for a picnic and it has a real street party atmosphere. We even managed to find a restaurant around the corner where we enjoyed dinner with the tower in front of us. We are really enjoying our time here, the language barrier isn’t too bad and the city is just beautiful. We won’t have any problems finding things to do in our short stay here. After a 9 hour overnight bus trip (which included a rocky ride on the English Channel Ferry) what better way to recover than relaxing at the foot of Paris’ Eiffel Tower. Basically we sat down in this spot at 11:30 am and didn’t leave it till after 4 o’clock in the afternoon, oh except to grab a baguette and a wheel of brie from the local grocer! The park was full of tourists, bridal parties having photos taken, locals walking their pooches, and a lot of others like us enjoying the sun and having a relax. Later in the afternoon we joined one of the very long queues to take the lift to the top of the tower. It was well worth it as we got a great view of Paris as well as getting a very close up look at the tower and many of its two and a half million rivets! Newton, the binochulars you gave us were particularly good for this trip, we got a great birdseye view of the Arc de Triompe, the Champs Elysee and the Seine. Whilst the tower is a bit of a tourist trap, and the constant throng of tour buses does make for crowded sightseeing, the surrounding areas are very beautiful and if one has the time they can be enjoyed at leisure. I think because most people on tours are rushing off to see something else they do not get a chance to enjoy some of the quieter, more pleasant aspects of the attraction. What is intersesting is that when the tower was built in 1889 the Pariseans hated it, however I think that attitude has changed and the tower is an Icon that the locals are proud of – it is also a pretty good antenna!